Equipped with a nickel custom-wound output transformer for accentuated highs, the EM-Blue is the brightest sounding of the EM Series. 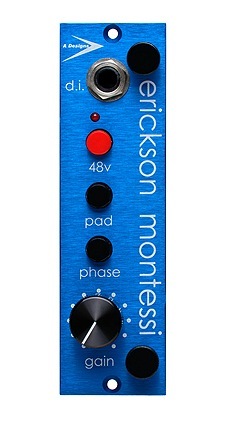 It produces a much more airy, top-end-present tone than its EM-Series brothers and sisters. Many aspects of recording can be counter-intuitive, and in many cases, you’ll want to pair opposites. For example, when used with a dark-sounding microphone or an alto vocalist, the brighter EM-Blue can produce a heavenly sound. You will also find this pre useful for providing a crisp “crack” when recording a snare drum. And if you use the DI you just might fall in love with what an electric guitar sounds like going thru its nickel transformers. As with all of A-Designs’ 500-Series preamps, the EM-Blue has a -20dB pad that enables you to get down and dirty with an electric guitar. Just switch in the pad and crank the gain for a slight growl.